Tracing letters on the floor with the tips of my scuffed shoes, I sat in a folding chair, my 7-year-old self waiting patiently for my parents to finish their conversations. The evening meeting at Family Camp had ended, and most people had filtered out of the building into the warmth of the humid, mosquito-laden summer night. When a woman approached my chair, crying, my attention was caught. Vaguely uncomfortable with her tears, I nonetheless froze when she leaned down and told me that someday I would write for God. In that time and at that moment, that meant nothing to me. Sure, I liked to read Little Women and the Little House books -- I was infamous for my bookworm tendencies, my year-round pale skin a testament to my habits. And I liked to write, but I was certainly no prodigy. My less-than-stellar poetry and fiction attempts were, quite frankly, pitiful. Yet, over the years, her words would return to me until they eventually settled into my bones, seeping into the very marrow of who I was and who I would become. And isn’t this true for all of us? We speak into our own lives and the lives of others with words, and they speak into ours. 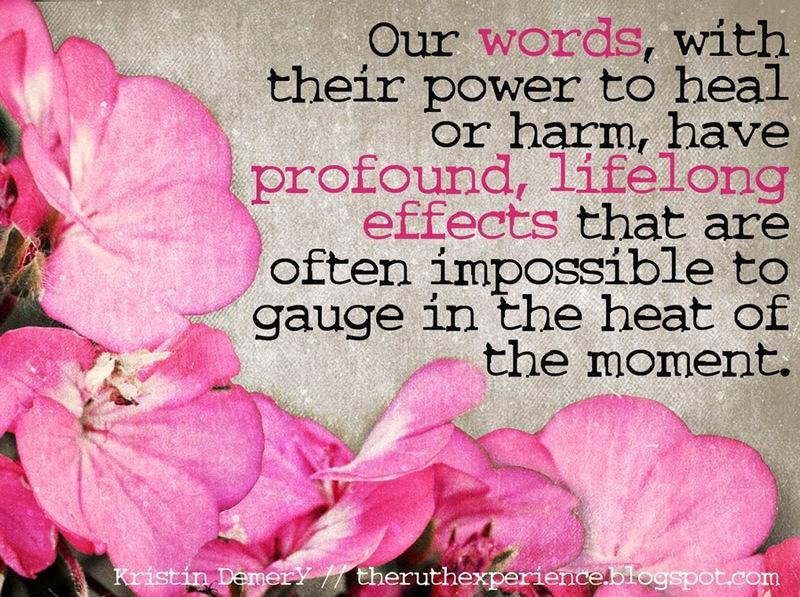 Our words, with their power to heal or harm, have profound, lifelong effects that are often impossible to gauge in the heat of the moment. The middle school friend that asked if she could date the guy I liked. The high school girls who called me “Little Miss Perfect” in a taunting way. The professor who told me that my copy-editing test was excellent and I should consider working at the college newspaper. The dad who kept asking when my first book would be published. The husband who tells me daily that he loves me. What words am I (and you, too!) speaking into the lives of those around you? Are you using them to heal or to harm? Today we're again linking up with our friend Sybil at Make a Difference Mondays. If you need a pick me up, then you'll want to check out these encouraging posts! I think about the words that I remember as a young girl, but I don't often think about how my words will be remembered years after they are said. Not to say that I am not aware of what I am saying, but just that I never thought about it from that perspective. Great post! Thanks, Heather! I have to admit that it worries me a bit with my children. I only want to speak good things into their lives, so my prayer is that they would remember the positive things I've said, rather than the once-in-a-while outbursts of anger and frustration. It's a little scary to know how much power our words have!